I'm always impressed when people come to the same event, and style their looks so differently! Take, for example, this recent Yacht City photoshoot with Boutikey, where a number of Boston bloggers were asked to style a look worthy of a day on a yacht. Of course, I knew Emily would go full on nautical-nice, and that Kelsey would rock some serious pink. I pictured an Italian signora on her second husband's yacht - she's entertaining the guests with little stories, secrets and limoncello while he studies the maps...printed dress, scarf holding back windblown hair, monster heels and simple makeup (well, and giant shades, of course!). Like the looks from this Yacht City shoot? My outfit is from The Orange Hanger in Arlington, and you can shop all the looks on Boutikey - the Boston-based app that allows you to shop your favorite boutiques! Learn more by following Boutikey on Facebook, Twitter and Instagram. You look so beautiful!!! 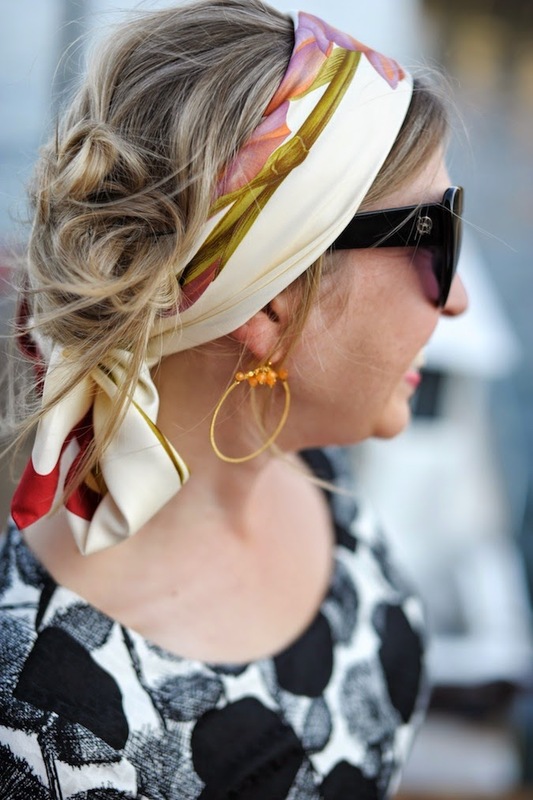 I love the scarf in your hair; so chic and timeless! That is one of my favorite scarves. Second Time Around, baby!! so dolce & gabbana! love the look! Dolce & Gabbana and the woman for whom D&G is made, the fabulous Scorpion Disco, were my inspirations! I love the dress and scarf detail! Too fun! The scarf was my favorite part of the look...OK,maybe the parrot! such a cute look on you! this shoot looks like it was a blast :) love the charm on your bag too!